Fake News: What is Fake News? So... What is Fake News, Anyway? This guide will explain the differences between "fake news," satire, bias and opinion, as well as different types of fake news. It will also give you the skills to critically examine news stories, science reporting, and various types of images. Although "fake news" has been getting a lot of attention recently, the problem isn't really a new one. Yellow Journalism was the term used to refer to a newspaper that emphasized sensationalism over facts in the late 1800s. 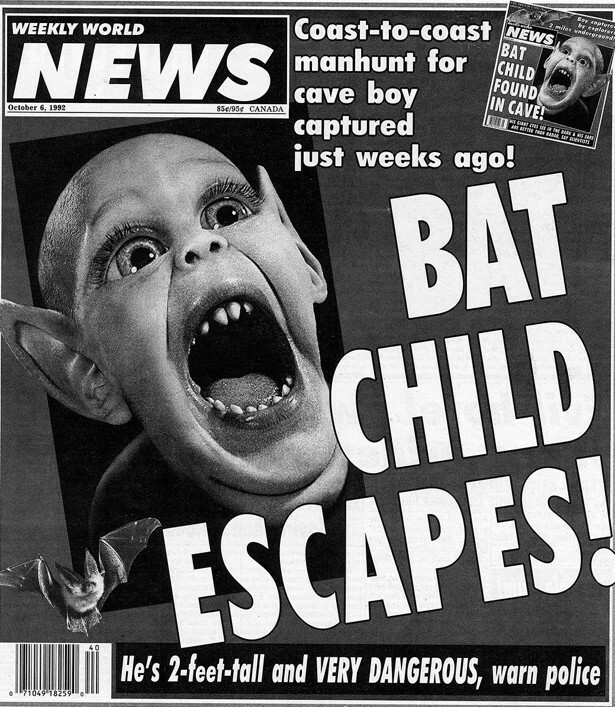 As depicted in the image above, yellow journalism focused on appeals to emotions and sensationalism. For a history of yellow journalism, visit the State Department's page. "Tabloid journalism" is another form of fake news many of us are familiar with. Tabloid journalism refers to a sensationalistic and deliberately false reporting. For more information on tabloid journalism, see voiceseducation.org. This series of stories appeared in 1835, claiming that an astronomer had found evidence of life on the moon, including unicorns and humanoid bats. Orson Wells caused panic in 1938 with a broadcast of “War of the Worlds,” a radio dramatization of a Martian invasion of Earth. In 1983 the Soviet Bloc spread a story that the United States’ had created the AIDS epidemic through medical experiments. 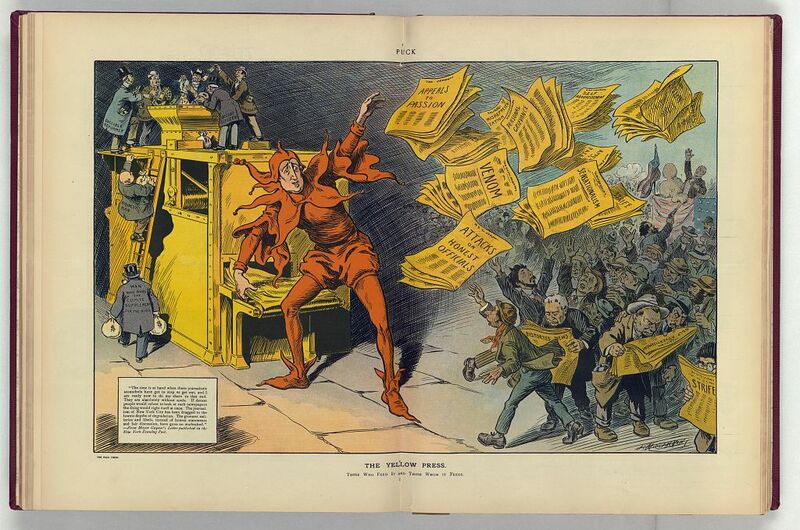 During the 1890s, Yellow Journalism sensationalized and even made up events to inflame public opinion, eventually helping push the United States into war. From the Middle Ages to Nazi Germany, various groups have used propaganda to accuse Jewish people of ritual murder. How Can I Be a Responsible User (and Sharer) of News? Think & check before you share! Above all - think critically & ask questions! Look for disclaimers, such as "for entertainment" or "satire"
Fake news, bias, opinion and satire can be closely related and can coexist within the same story, but can also be different. It is important to understand and consider all four when evaluating any source of information. ​As discussed in the section on "Types of Fake News," true fake news is false or misleading information written or shared with the intent of misleading the audience. Bias and opinion can play a role in the creation of fake news, but are also important to consider in traditional news sources as well. ​News can be biased without being fake, but you should always consider the potential bias or agenda in any source you are using, especially if it is not written by an expert. If a source is too biased, you may want to consider whether it crosses the line into "fake" news. Consider not only the bias of the source, but your own biases as well - we all have them! Do your pre-existing beliefs lead you to want to believe or disbelieve the story? If so, this is confirmation bias. Make sure you consider how your confirmation bias affects your ability to view the story objectively, and make sure you look for objective ways to verify or disprove the story. ​Be watchful of using items that appear in the opinion section of a newspaper or magazine as fact. Opinion sections are generally separate from the news, and may range from expert opinions on a topic to lay opinions. If you are going to use an opinion, make sure you understand who wrote the opinion piece, what expertise (if any) makes their opinion worth using, and what bias or agenda they might have. Dictionary.com defines satire as 1) the use of irony, sarcasm, ridicule or the link in exposing, denouncing or deriding vice, folly, etc. ; 2) a literary composition, in verse or prose, in which human folly and vice are held up to scorn, derision, or ridicule; or 3) a literary genre comprising such compositions. ​As discussed in the section on "Types of Fake News," satire is generally not intended to be taken seriously, but can cause problems if it is inadvertently shared as real news, or a reader doesn't realize it is satire. Indiana University East Campus Library Fake News guide was used for some of the content in this guide.